Torrential rains hit New Brunswick on September 30th, courtesy of Hurricane Joaquin. Some areas received more than 160mm (6.3") of rain, and drainage systems were overwhelmed. Many roads in southern New Brunswick were washed out and one person died in a related accident. Numerous bridges were damaged or washed out. 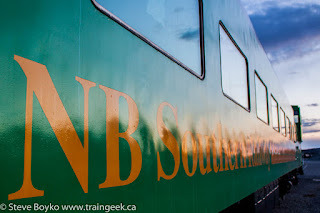 NB Southern Railway operations were suspended due to washouts and bridge damage in Hoyt, Wirral and in Maine (CBC article). Railfans noted work trains heading out from both McAdam and Saint John with ballast and other material in the past weeks to work on the damage. The St. Stephen subdivision had some minor damage but was not closed for more than a day or two. An NB Southern eastbound train arrived in McAdam this morning (October 11) so the line to Saint John is finally open again. I recall the washout of September 2008 - I was able to take a few photos of a washout in downtown Grand Bay.